I've always been a lover of seafood. Shellfish is definitely one of my favorite things to eat. Andy and I do a seafood boil every now and then. We boil all of the seafood in a pot and then lay everything out on a sheet pan. Then we go at it like some ravage beasts. It's a messy sight. But in my opinion, the ONLY way to eat a seafood boil is with your hands and to get messy. 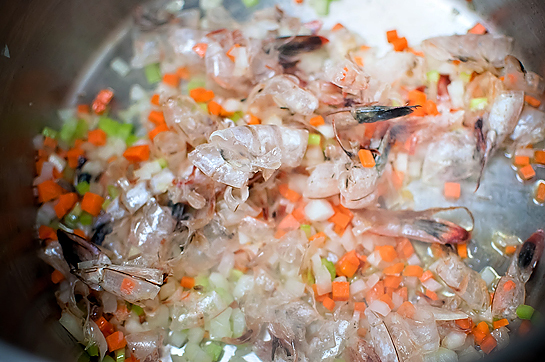 From these seafood boils, we usually end up with a bunch of shrimp shells. Most people might throw them away, but they're like seafood gold. And one of my favorite things to make with them is a good old fashioned bisque. A bisque is traditionally a shellfish soup thickened up with cooked rice. However, in today's sense, most bisques are thickened with a roux for better stability and consistency. 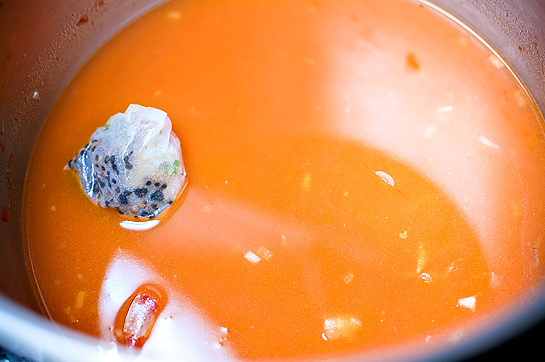 Follow the following steps and you'll have the perfect bisque every time. #1. Caramelize your mirepoix (carrots, onion, celery) and shellfish shells (you can use any shellfish, but I find shrimp the most practical and inexpensive). #2. 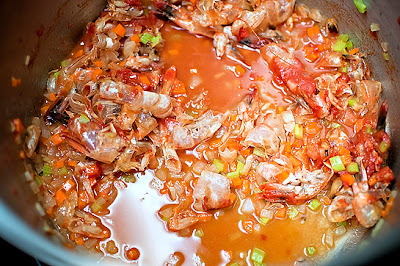 Add a tomato product (usually paste) and deglaze the pan with wine (usually white). #3. Add fish/seafood stock or a fish veloute (remember veloute is just a fancy word for gravy!) - it's also a good time to add a sachet of herbs too (mine had thyme, peppercorns, and bay leaves). #6. Puree the mixture (shells and all) and return to a simmer. #7. When you've achieved your desired flavor, strain the mixture through a fine mesh strainer or chinois. #8. 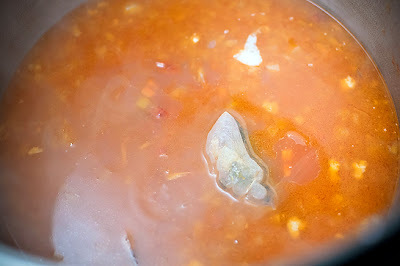 Return the soup back to the heat and bring to a simmer. Finish with cream, if desired. And now you've got yourself a bisque! Garnish with whatever shellfish you used in the broth and some fresh herbs. Soups don't get any better than this! Bisque its new for me but looks mouthwatering:). Hi Peggy! What a gorgeous color of bisque! 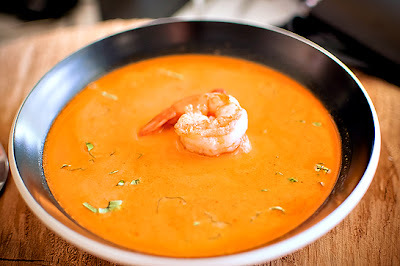 I'm a big seafood fan too, and this is one of my favorite soup. Never thought of attempting to make this at home though. It must be so delicious!!! This would make a wonderful Lenten meal. I bookmarked it for later. Yum! Wow, impressive! I've never made a bisque before. Looks very fancy and elegant! 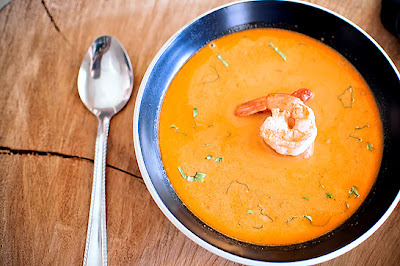 Your bisque looks amazing!!! Beautifully plated, too! Ohh I love this!! I love to make stock from shrimp shells and for some reason haven't made bisque - I've pinned to try soon, thanks! Congrats on the new marriage and the Blog!!! Love the recipes too! 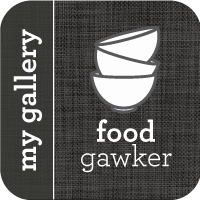 I add this new blog to my blog roll and started following you!! Good luck in both your nuptials and the blogging!! Seafood is one of my favorite food! Your bisque looks absolutely appetizing! Seafood gold is right! I can practically taste this lovely bisque! I love bisque! What great tips for making it perfect every time! I've never made my own bisque, this looks so good! I can't wait to try it.